The shortest month of the year has come to an end and that means spring can't be far away! For Long Island beer lovers that means spring beer festivals, so make sure to check out the LIBeerGuide Festivals page and get tickets to your favorite fests before they sell out. On tap in April are the Spring Craft Beer Festival at Belmont on April 1, the Cask Ale Festival fundraiser at Mill Roadhouse on April 8 and TAP New York at Hunter Mountain on April 29-30 (LI Beer Bus/Tapped Enterprises is running buses from Long Island on April 29). Two new festivals are also coming in May, a spring version of the Nautical Mile Brew Fest in Freeport on May 13 and the first Patchogue Craft Brew Fest at the Emporium on May 20. Speaking of festivals, we want to welcome new subscribers to LIBeerGuide Brewsletter who signed up at the Hops & Props Craft Beer Festival at the Cradle of Aviation on February 11. We look forward to keeping you updated on the LI beer scene and hope to see you at another festival this spring! 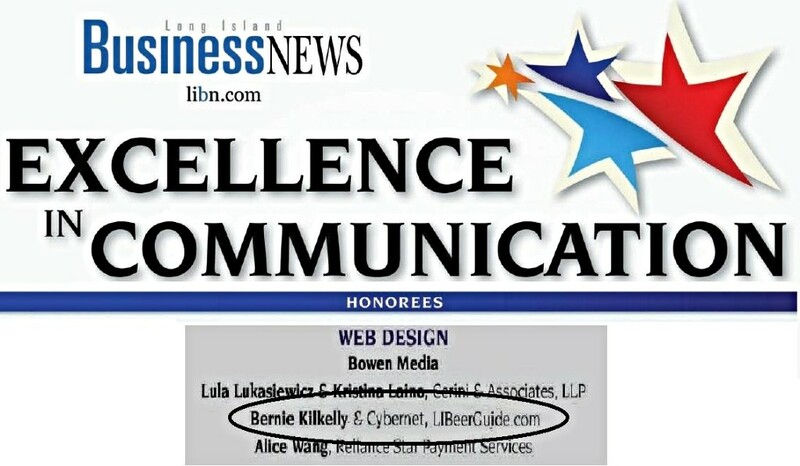 Long Island Business News has recognized LIBeerGuide publisher Bernie Kilkelly and our web design firm Cybernet for Excellence in Communication in the category of Web Design. The awards will be presented on March 22, which also marks the first anniversary of the day when LIBeerGuide.com went live. We have been gratified by the support of the LI beer community in our first year and look forward to providing even more content to help our readers enjoy all the great things happening in the LI beer scene. Two people who have made important contributions to the growth of the beer community on Long Island were honored by their own communities in February. Matt Buck, the general manager of Plattduetsche Park Restaurant, Catering & Biergarten in Franklin Square, was the honoree on Feb. 26 at the annual George Washington Birthday Dinner held by the Plattduetsche Volksfest Vereen society. Matt was the force behind building the Plattduetsche's new beer hall that opened in 2013 and has been a strong supporter of Long Island craft breweries. Tom Keegan is one of the founders of the BrickHouse Brewery, the pioneering Patchogue brewpub that celebrated its 20th anniversary last year. Tom was also the founder 20 years ago of the Patchogue St. Patrick's Parade and has run the parade every year since. At this year's parade on March 19 he will serve as Grand Marshal, and on February 26 he was honored at the Passing of the Sash ceremony held at the BrickHouse. Congratulations to Matt and Tom! 1) Montauk Brewing Co. -- Montauk Brewing was established in 2012 by three lifelong friends, Eric Moss, Vaughan Cutillo and Joe Sullivan, who focus on their individual areas of expertise -- Eric as brewmaster, Vaughan as head of marketing and Joe as head of business development. Montauk Brewing's initial growth came from the smart idea of contract brewing their flagship Summer Ale and Driftwood Ale to be distributed in cans, making them great beers to bring to the beach. While these beers and the popular Session IPA continue to be brewed and canned at Wachusett Brewing in Massachusetts, Montauk Brewing opened their own brewery in 2015 in a building that formerly housed Montauk Woodwork, owned by Vaughan's father. The new brewery's 15-bbl system allowed Eric to produce a wide range of beers and he has experimented with making beers using local ingredients including a Rye Pale Ale made with hops from Mattituck. The brewery's tasting room, which doubles as an art gallery showing local artists, is open during the off season from Thursday to Monday. 2) Shagwong Tavern -- the historic Shagwong in the heart of town dates back over 80 years and was well known for its no frills bar and fresh seafood. New owners took over in 2015 and have given the tavern a fresh look and a renovated kitchen that is winning high marks for prime rib, burgers and of course fresh seafood. Shagwong has 12 beers on tap with one of Montauk Brewing's beers always on. 3) Montauk Beer & Soda -- Montauk Beer is the best place in town to stock up on craft beer. The store does not have a growler station but the craft beer selection is very good, with of course Montauk Brewing cans available. 4) Zum Schneider Montauk -- The Montauk outpost of the popular East Village German restaurant opened in 2012 and is a popular spot during peak season for authentic German food and beer. 14 German beers are on tap and the restaurant's owner, Sylvester Schneider, is often busy singing with his oompah band or playing with the restaurant's soccer team. Zum Schneider Montauk will reopen for the season on St. Patrick's Parade weekend. 5) The Point Bar & Grill -- The Point is a popular sports bar with hearty pub grub and is also well known for its late night dance parties. Happy Hour from 4-7 pm on weekdays features 1/2 price beers and 1/2 off select apps. 6) Saltbox Restaurant & Bar -- for a more low key dining experience, check out The Saltbox Restaurant which is owned by the same folks as the Shagwong. Taking over the spot of a traditional Irish pub, O'Murphy's (which moved to a new location at Montauk Harbor), the Saltbox was transformed into an upscale gastropub with a menu focusing on locally sourced ingredients. There are 6 beers on tap including Montauk Brewing. 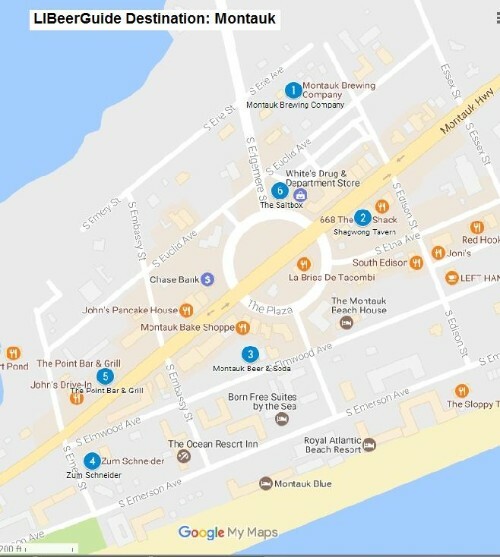 For visitors coming from New York City and other points west, Montauk's beer destinations are about a mile walking distance from the LIRR Montauk station, the last stop on the Montauk line. On March 26, LI Beer Bus/Tapped Enterprises will be running buses to the annual Montauk St. Patrick's parade. The bus ride will include beer from Montauk Brewing, snacks and other giveaways. Beer store -- Brookville Beer & Beverage, conveniently located on Peninsula Blvd. 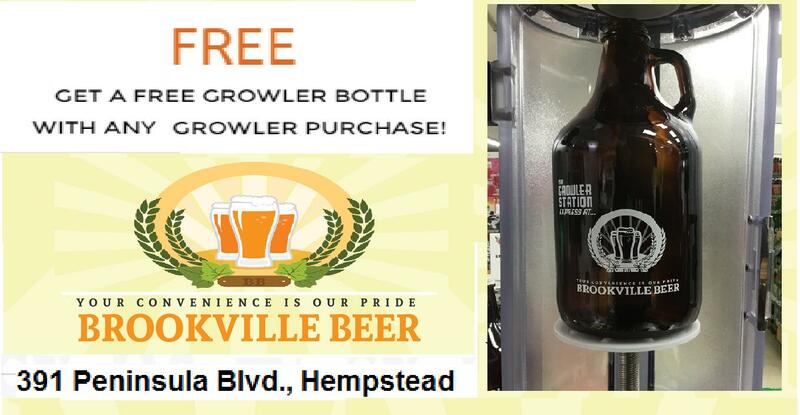 in Hempstead, has one of the best craft beer selections in Nassau County and a state-of-the-art Growler Station with 6 rotating craft beers on tap. Gastropub -- Publicans recently reopened in Manhasset after an extensive renovation that turned the neighborhood tavern into an upscale gastropub. Known as Edison's from 1999 to last year, the site was originally the home of Dickens, a tavern that opened in 1948. The first Publicans opened in 1977 and was immortalized in J.R. Moehringer's 2005 memoir "The Tender Bar." The new Publicans features 24 beers on tap including many Long Island brews. Beer Bar -- Bar Louie Massapequa opened in February at the Westfield Sunrise Mall and is the second Long Island location of the Texas-based chain, with the other in Commack. Bar Louie is a large, lively restaurant with 30 beers on tap including many Long Island brews. Happy Hour from 4-7 pm weekdays features $4.25 drafts and 1/2 price on select apps and flatbreads, and there is a late night Happy Hour from Sunday to Thursday after 10 pm to closing. April 1 -- 11th Annual Spring Craft Beer Festival, Belmont Park. Afternoon session 12:30-4 pm, Evening session 5:30-9 pm. April 8 - 2nd Annual Cask Ales Festival Fundraiser, Mill Roadhouse, Westhampton Beach. 4-8 pm, benefiting the Barton Center for Diabetes Education. April 29 - LI Beer Bus/Tapped Enterprises bus trip to Tap New York Craft Beer & Food Festival, Hunter Mountain. Includes a ticket to the festival. May 13 - Nautical Mile Brew Festival, Tropix on the Mile, Freeport. Two sessions, 1-4:30 pm and 6- 9:30 pm. May 20 - Patchogue Craft Brew Festival, The Emporium, Patchogue. Two sessions, 1-4:30 pm and 6- 9:30 pm. For more events and festivals check out LIBeerGuide's Events page.